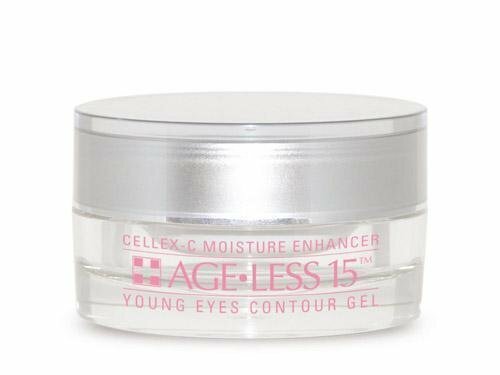 ellex-C Age-Less 15 Young Eyes Contour Gel helps recreate a youthful looking eye contour by adding fullness to the cushion of the skin just beneath the brow bone while smoothing fine lines, wrinkles and “crows feet”. ActivePhyto-amino Peptide Complex, Bisabolol, Lecithin. InactiveWater, Glycerin, Caprylic Triglyceride, Glyceryl Sterate SE, Stearic Acid, Lecithin, Cetearyl Alcohol, Tocopheryl Acetate, Polysorbate 60, Glyceryl Sterate, Jojoba Esters, Polysorbate 20, Evening Primrose Oil, Aloe Barbadensis Gel, Palmitoyl Oligopeptide, Palmitoyl Tetrapeptide-7, Phenoxyethanol, Dimethicone, Sorbitan Sterate, Allatonin, Disodium EDTA, Azulene.